Marion Wallace-Dunlop was not about to accept this state of affairs, she was a proud Scot who claimed descent from the mother of William Wallace. Her response to the establishment’s rebuttal of her right to petition was to have a ‘Rubber Stamp’ made (or perhaps she made it herself) of the wording of the relevant provision of the Bill of Rights and on the afternoon of 22nd June 1909 she presented herself at the House of Commons and asked to see John Clynes, a prominent Labour MP. The gentleman who accompanied Wallace-Dunlop was admitted to Central Lobby but, as a woman, she was permitted no further than St Stephen’s Hall. This was a rule instituted by the Serjeant at Arms in response to numerous demonstrations by suffragettes in Central Lobby. 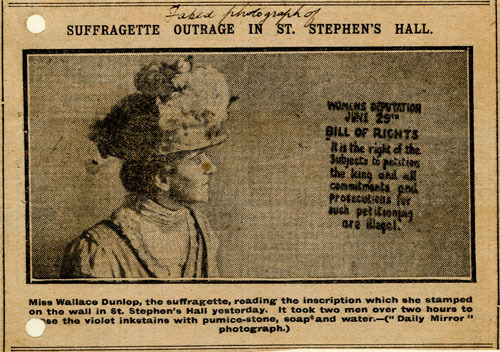 The police report by Inspector Scantlebury states that Wallace-Dunlop was observed by PC Boyce to be ‘doing something to the wall above her seat.’ PC Boyce’s prompt action prevented Wallace-Dunlop’s attempt to stamp the words of the Bill of Rights on the wall but although she was found in possession of a ‘rubber pad about 12 x 6’, she was merely ejected from the building, having first been relieved of the rubber pad, and informed that she would not be admitted again. However Wallace-Dunlop had obviously taken the precaution of having more than one stamp. Two days later, on 24th June, she returned to Parliament again accompanied by a gentleman. Inspector Scantlebury’s report of this incident tells us that she was not recognised because she was ‘very much disguised from what she was on 22nd.’ On this occasion it was PC Parsons was on duty, and he observed that as the gentleman left, she got up from her seat and walked towards the exit. PC Parsons noticed that the wall above where Wallace-Dunlop had been sitting had been stamped with the words, ‘Women’s Deputation June 29th’ followed by the extract from the Bill of Rights. Police report on Marion Wallace-Dunlop’s second attempt to stamp on the stonework, 24 June 1909. Parliamentary Archives, HC/SA/SJ/10/12/20. On the 2nd Wallace-Dunlop applied for a further adjournment, but this time was unsuccessful. She stated that she stamped the words on the wall because there was, ‘a danger of their being forgotten by legislators.’ She was fined £5 plus £1 1s 2d, the cost of the damage, and in default of payment she had to serve one month’s imprisonment, without hard labour. Mr Bennett stated that whilst the police were perfectly justified in taking Mr Duval into custody, taking all things into consideration he would discharge him. Exactly what things were taken into consideration was not, however, stated. Wallace-Dunlop refused to pay her fine and was accordingly committed to Holloway Prison where on 5th July she petitioned the Governor: ‘I claim the right recognised by all civilised nations that a person imprisoned for a political offence should have first-division treatment; and as a matter of principle, not only for my own sake but for the sake of others who may come after me, I am now refusing all food until this matter is settled to my satisfaction.’ The prison doctor, who had placed her in the prison hospital on her admittance as he considered she was already in poor health, realised that she would not stop her hunger strike and saw that her health was deteriorating. He brought the matter to the attention of the Prison Commission who instructed the Governor to release her immediately. Her 91 hour hunger strike had defeated the one month sentence. Thus came about what was arguably the most potent weapon unleashed during the suffragette campaign. Initially many other suffragettes sentenced to terms of imprisonment went on hunger strike and were soon released; but the authorities could hardly let that state of affairs continue so forcible feeding was introduced, bringing sympathy to the suffragettes and bad publicity to the government. Eventually, fearful that there would be deaths leading to even worse publicity, the government passed the Prisoners (Temporary Discharge for Health) Act – better known as the ‘Cat and Mouse Act’ – in 1913. Under the provisions of this Act, women who were becoming dangerously weak could be released and, when sufficiently recovered, returned to prison to continue their sentences. Wallace-Dunlop continued her work with the suffragette movement and played a major part in organising many of their parades and processions, the most spectacular of which was the Woman’s Coronation Procession on 17th June 1911. An accomplished artist, she had paintings exhibited at the Royal Academy and also in Paris where she studied art. In September 1942 she passed away peacefully in a Guildford nursing home. Leah Leneman, ‘Dunlop, Marion Wallace- (1864–1942)’, Oxford Dictionary of National Biography, Oxford University Press, 2004; online edn, April 2016.